About a year ago I asked you the question “do you like what I’m doing?“, and it was the start of a real rollercoaster ride for me. I had no idea when I asked for your nominations for a MAD Blog Award last year that I would actually end up winning it! Winning the award for “Most Innovative” blog means so much to me, and it is one of the strongest things that keeps me writing new content and working to continue innovating and improving my blog. I really can’t thank everyone who supported me during both the nominations phase and the voting phase last year enough. You’re all lovely, and I owe you all many hugs. Truth be told, I’ve been holding off from writing this blog post. I’ve been trying to work out how to pitch it. I don’t want to irritate you all by repeatedly asking for votes for things, but at the same time I want to make sure that you know these things are happening and how much I’d love to be nominated if you feel I deserve it. It’s a balancing act as far as I’m concerned, and it’s also complicated this year by the fact there are two major parent blogging awards running – with the Brilliance in Blogging awards coming along as well as the MADs. I’ve also been pestering you all on Facebook and Twitter recently to vote for me in the Top 25 Tech Moms of 2012, and again I can’t say thank you enough for voting me into a very respectable 19th place. So if you feel well disposed enough towards me to give me a little more support, I would first of all love the chance to defend my title at the MAD Blog Awards this year. These awards work the same way as they did last year – the four blogs that receive the most nominations will be named as finalists for a second voting round, along with one judges’ choice. Every nomination counts, so please head over to the nomination form and vote for me. I’m happy to receive nominations in any category that you think best, but I’m really hoping for lots of support in the “Most Innovative” category. Anyone can nominate in these awards – you don’t need to be a blogger, or UK-based. It’s a two-stage nomination form – you have to pick a “blog of the year” first, and once you’ve done that you can nominate in as many of the other categories as you like. 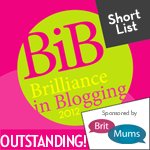 Next up are the Brilliance in Blogging Awards, and I’m so pleased that I’ve made the shortlist in two different categories – the “Video” category and the “Outstanding” category. I can’t tell you how delighted I am to have been shortlisted in both these categories alongside so many other great bloggers. Voting is currently open for these awards to whittle the shortlists down to 8 in each category which will go in front of a voting panel to decide the ultimate winner. Voting is very easy for these awards – just a simple checkbox against your blog choice, and again anyone can vote. So if I haven’t already taken too much of your goodwill, would you consider heading over to the voting form and giving me your support? Voted for you on both 🙂 Keep blogging!